Writing in the New Yorker, Alexandra Schwartz praises the bookshops of France in general, and of Paris in particular, and then gets a nasty surprise when she pays a return visit to the legendary Shakespeare & Co. Failing to understand, I tried to move past her. She blocked my way. The shop had too many visitors to fit inside at once, she explained. Would I just stand to the side and wait my turn? A bookstore that has become a monument to itself, even a wildly popular monument, has lost its living essence. If this is what the French are trying to protect against, good luck to them. Rebuffed by Shakespeare, I did what you do when you have the luxury of choice, and went around the corner to the Abbey Bookshop, on the Rue de la Parcheminerie, where I found Kushner’s book smack in the middle of the shelf, right next to Kundera and Lawrence. via Vive La Bookstore! : The New Yorker. Katherine Rundell’s charmingly lyrical style is dotty in the way Charles is dotty. In the London section she seems interested mainly in conversations, which have a high quota of witticism (wearing a skirt, Sophie looks as if she’s "mugged a librarian") and aphorisms (lawyers have all "the decency and courage of lavatory paper"). In general, her metaphors are determinedly original. Such verbal showiness, though entertaining, has the disadvantage of showing up the misses as well as the successes, and in the early stages the story has the contrived manner, but not the solidly exciting matter, of a fairytale. This changes the moment Sophie climbs up through the skylight in her Parisian hotel bedroom to the rooftop above. All her life she has been a keen tree-climber, drawn to heights. Now, standing above the city, she is liberated – and the story is liberated with her. Almost immediately she realises she’s not alone up there. A feral boy called Matteo lives on the roof of the law courts, and the drama of his encounter with Sophie and their subsequent partnership is thrilling. The roof-top world is grittily real, the stuff of broken toes and roasted rat and howling gales. Breaking away from Charles’s protection, Sophie finally expresses the Pippi Longstocking-like wilfulness only coyly hinted at before. Even the showy metaphors thin out. There’s a gripping journey of exploration, an extraordinary feast and a tremendous fight between Sophie, Matteo and their tree-dwelling friends and a wolf-like pack of boys from the station area. via Rooftoppers by Katherine Rundell – review | Books | The Guardian. Despite his rackety life, he lived to be 89. He was in some ways his own best creation, and “Nadar” was both an artistic signature and a shrewd commercial logo. His real name was Gaspard-Félix Tournachon: a tall, exuberant man with a vibrant circle of friends and a beloved wife. Jules Verne called him “an Icarus with replaceable wings”. 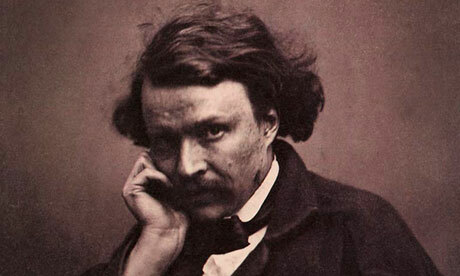 So this brooding self-portrait, taken in 1854, is a typical Nadar paradox. Never trust a biographer on the subject of himself. I shall always be grateful to him. via My hero: Félix Nadar by Richard Holmes | Books | The Guardian.